Rockhurst University, Kansas City, MO. 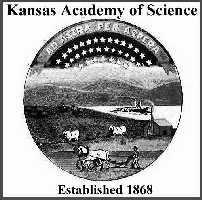 *Bader, K.S., Natural History Museum and Biodiversity Research Center, University of Kansas. TETRAPOD TRACKWAYS AND PALEOENVIRONMENTAL INDICATORS FROM THE BONNER SPRINGS SHALE (UPPER PENNSYLVANIAN) IN JOHNSON COUNTY, KANSAS. Three types of tetrapod trackways were collected from a roadcut on I-435 highway in Johnson County, Kansas. The trackways occur in a gray siltstone directly underlying a caliche horizon roughly one meter below the upper boundary of the Bonner Springs Shale in a paleosol. In all three trackways the individual prints range from 1 to 3 cm in length and up to 2.5 cm in width. Often associated with tail drags, the first tetrapod trackway has four clawed digits and a fifth reduced digit on the inside of the manus. The second tetrapod trackway has five distinct digits with expanded pads on the tips of the phalanges on both the manus and pes. The third tetrapod trackway occurs farther south in the outcrop than the other tetrapod tracks and is interpreted as a swimming trace where a clawed foot with four digits scraped the bottom in shallow water. Accompanying the third trackway are invertebrate traces, tool marks, and both current and wave ripples. The presence of both trackways and the overlying paleosol indicate a sea level regression during the time of deposition of the Bonner Springs Shale. The first two tetrapod trackways occur in a localized area, the water margin, with a transition to shallow water with ripples, swimming traces, and invertebrate trace fossils farther south in the outcrop. *Beatty, B. L., Division of Vertebrate Paleontology, University of Kansas Natural History Museum. TESTING THE USE OF THE EXTANT PHYLOGENETIC BRACKET FOR MAKING PALEOBIOLOGICAL INFERENCES. The inference of various paleobiological characteristics of fossil animals has long been the realm of discussion sections following descriptive texts of osteology. While living animals allow us to observe soft anatomy and behavior, the interpretation of the same in fossil taxa has been left to qualitative arguments of justification. The most parsimonious inference of such unknowable characteristics has been suggested to be those that are shared by the Extant Phylogenetic Bracket (EPB). This holds that given a crown group including the fossil taxon in question, we should assume that it shares characteristics that are shared between its fellows in the crown group and that of the sister taxon to the crown group. To test the reliability of this method of inference I propose to use the EPB method to make a prediction of a character state for an extant, known taxon. After making this prediction we can compare it with the known character state of the same extant taxon and, compiling such data for the entire clade, assign a character predictability index (CPI) for the character being inferred. With this CPI we can compare the relative security with which we can make inferences about certain behaviors and anatomical features. To avoid circular reasoning, these comparisons could be performed using a molecular phylogenetic tree. Once a CPI is well established for modern knowable taxa we can then move on to making paleobiological inferences based upon the EPB with a measure of our confidence in the results concerning each type of character. *Burnham, D.A. Department of Geology, The University of Kansas. COMPARISON OF THE TARSUS AND PES IN THE DROMAEOSAURS BAMBIRAPTOR AND MICRORAPTOR. Controversies surrounding evolution of flight are usually framed around the hands and arms (wings) rather than the structure of the foot. The anatomy and functional morphology of deinonychosaur tarsus and pes has been overlooked and is herein examined in light of recent discoveries. The study included a cursorial form, Bambiraptor (North America), and a newly reported arboreal form, Microraptor (Asia). Lifestyles of these animals should be reflected in the morphology of their feet since locomotion is fundamentally different between ground and tree-dwelling forms. It was found that the arboreal and cursorial morphotypes do have contrasting foot morphology, although both possess the retractable sickle claw, a synapomorphy of the Dromaeosauridae. The arctometatarsalian foot of Microraptor was proportionally smaller with deeply recurved claws on each digit, the hallux was reversed, and long, vaned feathers attached to the tarsus. These feathers alone would seem to encumber a cursorial lifestlye. It is more likely that it was arboreal, using the sickle claw for climbing with the reversed hallux and recurved unguals for perching. The foot of Bambiraptor had a normal tarsus that functioned well as a killing claw to disembowel prey. The hallux was not reversed and was positioned more proximally than Microraptor. The flattened pes unguals, combined with other features, implies it was cursorial. The resulting insight on foot morphology and function indicates the tree-dwelling forms acquired the specialized claw apparatus for climbing much earlier than the cursorial members of this group who subsequently modified the claw as a weapon. This would seem to support that an arboreal phase took place during the evolution of flight in birdlike dinosaurs. *Christopher, M.T., Division of Vertebrate Paleontology, University of Kansas. THE NEW FOSSIL PREPARATION LABORATORY IN SCIENCE CITY AT UNION STATION, KANSAS CITY. A new live fossil preparation exhibit is being developed through the collaboration of Science City at Union Station and the University of Kansas Natural History Museum and Biodiversity Research Center. This new exhibit will benefit the University by expediting preparation, mounting, and study of dinosaur specimens collected by KU paleontologists and volunteers in 1997. Science City will eventually house the prepared and mounted dinosaur; a large adult Camarasaurus nicknamed Lyle, which, along with the fossil lab, should boost attendance. Attendees will be able to view preparation of the dinosaur in progress and a volunteer preparation program will allow qualified individuals to participate in that project. The laboratory will be constructed within Science Citys existing paleontological exhibit area. The exhibit is expected to open, and fossil preparation to begin, upon completion this autumn. *Everhart, M. J., P. A. Everhart and K. Ewell. Sternberg Museum of Natural History, Fort Hays State University. A MARINE ICHTHYOFAUNA FROM THE UPPER DAKOTA SANDSTONE (LATE CRETACEOUS). The Dakota Sandstone in Kansas is composed of mudstones and channel sandstone lenses deposited at the mouth of a river flowing into the Western Interior Sea from the northeast during Middle Cenomanian time. The formation is well known for beautifully preserved impressions of deciduous leaves, but has an otherwise poor record for vertebrate remains. A marine ichthyofauna is reported here for the first time from the Upper Dakota Sandstone near Wilson Lake in eastern Russell County. The interbedded sandstones and shales exposed at this locality represent the transition from non-marine, deltaic deposits to a shallow-water, marine environment at the beginning of the Greenhorn Transgression. The micro- and macro-vertebrate faunal assemblage is derived from a two layers of poorly cemented sand within 6 m of the contact with the Graneros Shale. To date, the Wilson Lake fauna consists of 20 taxa: 7 sharks (Hybodus sp., Polyacrodus sp., Cretoxyrhina mantelli, Cretolamna appendiculata, Carcharias amonensis, Cretodus semiplicatus, and Squalicorax falcatus); 6 rays (Rhinobatos incertus, Pseudohypolophus mcnultyi, Chiloscyllium greeni, Onchopristis dunklei, Ptychotrygon sp., and Cretomanta canadensis); and 7 bony fish (Coelodus sp., Hadrodus sp., Pachyamia sp., Lepidotes sp., Enchodus sp., Xiphactinus audax, and Protosphyraena bentonianum). The teeth of Carcharias and Rhinobatos are the most abundant of the sharks and rays, and Enchodus sp. is the most abundant bony fish. The species represented in the Wilson Lake fauna suggest a shallow marine environment located on the edge of a river delta near the eastern shore of the Western Interior Sea. *Ewell, K. and M. J. Everhart, Sternberg Museum of Natural History, Fort Hays State University. A PALEOZOIC SHARK FAUNA FROM THE COUNCIL GROVE GROUP (LOWER PERMIAN). In 2003, abundant vertebrate remains consisting of unassociated shark teeth, dorsal fin spines and preserved cartilage were discovered in a narrow (2-3 cm) seam of poorly consolidated limey mud near the base of the Neva Limestone Member of the Genola Limestone Formation (Council Grove Group, Lower Permian) in southeastern Geary County, Kansas. Remains identified included the teeth of the Paleozoic sharks Cladodus occidentalis, Petalodus alleghaniensis, Agassizodus variabilis, Acrodus sp., Chomodus sp., and a chimeroid (cf. Sandalodus sp. ), dorsal fin spines of Physonemus mirabilis and a hybodont shark (cf. Lissodus sp. ), and scales of Holmesella quadrata. The mud layer contains a high percentage of coarsely ground shell and bone fragments, and is interpreted as a re-deposit generated by a major storm or tsunami type event. Another nearby site produced dorsal fin spines of Ctenacanthus cf. amblyxiphias, teeth of Cladodus sp. and Petalodus sp., and preserved cartilage in association with abundant invertebrate remains, while teeth of Petalodus sp. and Chomodus sp., and an unidentified dorsal fin spine fragment were collected at a third site. Cladodus teeth were the most frequently recovered remains at Site 1, while Ctenacanthus dorsal fin spines and Petalodus teeth were the most common remains at Site 2 and Site 3 respectively. Differing conditions of deposition are indicated by the condition and abundance of vertebrate remains at each site. *Gobetz, K.E., and J.L. Green, Natural History Museum and Biodiversity Research Center, University of Kansas, and Florida Museum of Natural History, University of Florida. COMPARISON OF KANSAS AND FLORIDA MASTODON DIETS USING PHYTOLITHS IN CALCULUS. Pilot studies to extract opal phytoliths from calculus on the molars of mammoth Mammuthus columbi and mastodon Mammut americanum from Kansas suggest that phytoliths may reveal major dietary constituents. Calculus of late Pleistocene Kansas M. americanum contained a mixture of pooid (cool, moist) grasses and deciduous tree leaves, suggesting that mastodons in Kansas may have been mixed-feeders rather than exclusive browsers. These results vary from the traditional view of mastodons as forest-dwelling browsers. They may reflect a preservation bias due to high amounts of silica in grasses compared to dicotyledonous plants. Alternatively, Kansas mastodons may have been mixed-feeders as a result of habitat. M. americanum phytoliths from Aucilla River (Pleistocene: late Rancholabrean) in Florida are compared with Kansas mastodon phytoliths to determine possible regional differences in diet. Previous mastodon dietary studies from Aucilla River using isotopes, microwear, and gastrointestinal contents have shown mastodons to be primarily browsers. Comparative studies of Kansas and Florida mastodons may help to resolve these questions and refine the use of phytoliths as dietary indicators. *Gobetz, K.E., and L.D. Martin, Natural History Museum and Biodiversity Research Center and Department of Ecology and Evolutionary Biology, University of Kansas. SOCIAL BEHAVIOR IN EXTINCT BEAVERS. Recently the discovery of an Oligocene beaver den in France documented the antiquity of social behavior characteristic of the modern semi-aquatic beaver, Castor. At about the same time (Oligocene), a group of North American beavers with short tails and flattened incisors (Palaeocastorinae) radiated into upland terrestrial fossorial niches. These beavers developed social structures more similar to those of fossorial squirrels than to other beavers. The species Palaeocastor fossor constructed deep (up to 3 m) burrows that were organized into large colonies of several hundred. These were probably similar to modern prairie dog colonies. A second, larger species, P. magnus, inhabited smaller aggregations of burrows that were spatially separated from the colonies of P. fossor. The smallest-sized beaver, Pseudopalaeocastor barbouri, excavated burrows of about 1 m depth. These are found in small groups of less than 10, and may occur within the P. fossor colonies. The difference in depth between burrows of the separate genera indicate a niche difference between these two beavers that enabled them to live in close proximity to one another. *Hamm, S., Department of Geology, Wichita State University, D. Cicimurri, B. Campbell, Geology Museum, Clemson University. CHONDRICHTHYANS FROM THE PENNSYLVANIAN (DESMOINESIAN) LAKE NEOSHO SHALE MEMBER OF THE ALTAMONT LIMESTONE IN SOUTHEASTERN KANSAS. The Pennsylvanian Lake Neosho Shale Member (Desmoinesian) of the Altamont Limestone has recently yielded a moderately diverse chondrichthyan fauna consisting of teeth, cephalic spines and dermal denticles. These specimens represent the first vertebrate remains documented from this formation in Kansas. The vertebrate assemblage includes Edestus sp. (Leidy), Caseodus eatoni (Zangerl), Cladodus occidentalis (Agassiz), Petalodus ohioensis (Newberry & Worthen), Lagarodus angustus (Romanovsky), Listracanthus histrix (Newberry & Worthen), Petrodus patelliformis (MCoy), and an indeterminate selachian finspine. The Lake Neosho Shale was deposited in a low energy, shallow-water, nearshore marine environment. Many of these taxa have been recovered from temporally equivalent rocks of Iowa, Illinois, Missouri, Oklahoma, Colorado and South Dakota. *Martin, L.D. Museum of Natural History and Department of Ecology and Evolutionary Biology, University of Kansas. ARE HYRACODONTIDS RUNNING TAPIRS? Hyracodontids are Eocene-Oligocene Perrisodactyls that include the most cursorially adapted ungulate (Hyracodon) of the Oligocene. Traditionally, they have been considered rhinocerotoids because of their advanced lophate molariform teeth. The incisors, however, retain the primitive tapiroid condition. More importantly, the upper first premolar has a deciduous precursor, a feature known in tapirids, but rarely seen in other mammals. It seems likely that this is a derived character for tapirids and may provide a synapomorphy uniting them with hyracodontids. The Eocene genus Hyrachyus was considered a tapir by Radinsky and is thought by some to be close to the basal stock that gave rise to hyracodontids. Although sometimes called a running rhinoceros, Hyracodon might be better considered a cursorial dry land tapir. *Perry, J.W. and B. May, Sam Noble, Museum of Natural History. AN EXAMINATION OF PLESIOSAUR REMAINS FROM BRYAN COUNTY, OKLAHOMA. An incomplete postcranial plesiosaur skeleton removed, December, 2001, from a site located in the Lewisville member of the Woodbine formation from upper Cretaceous material of Bryan County, Oklahoma will be assessed. Recovered remains consisted of seventy six vertebrae (30 cervicals, 2 pectorals, 15 dorsals, 1 sacral dorsal, 3 sacrals and 25 caudals), associated axial skeletal fragments and portions of the pelvic girdle. *Schumacher, B. A. and M. J. Everhart, Sternberg Museum of Natural History, Fort Hays State University. 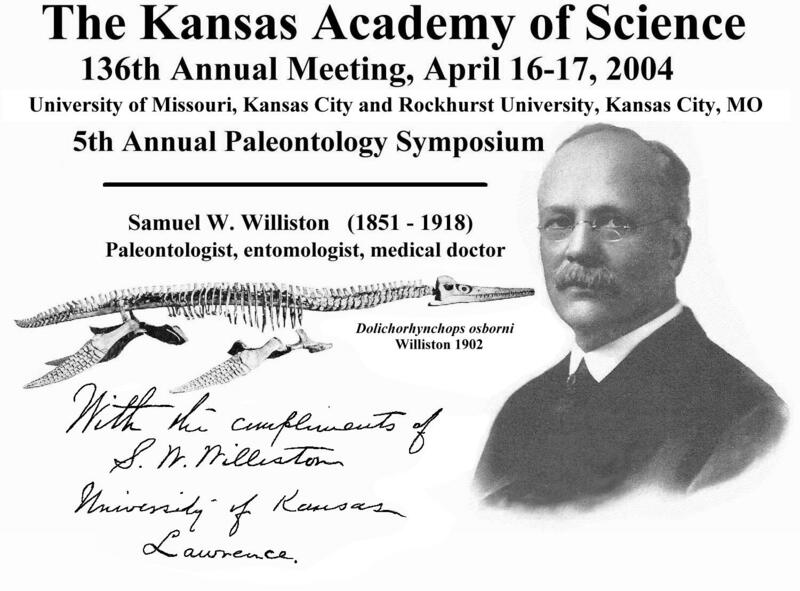 A NEW ASSESSMENT OF PLESIOSAURS FROM THE OLD FORT BENTON GROUP, CENTRAL KANSAS. The old Fort Benton Group in central Kansas has produced a relatively large number of plesiosaur (pliosaurid, polycotylid and elasmosaurid) specimens. In modern terminology this stratigraphic term refers to the Graneros Shale, Greenhorn Limestone, and Carlile Shale (Middle Cenomanian to Middle Turonian) of the Western Interior. In particular, the Fairport Chalk Member, Carlile Shale, has produced an unusually high number of plesiosaur remains in light of the fact that it is characteristically poorly exposed and minimally accessible. A giant pliosaurid (Brachauchenius lucasi) is known from the basal Lincoln Limestone Member, Greenhorn Limestone (Middle Cenomanian) to the middle of the Fairport Chalk. 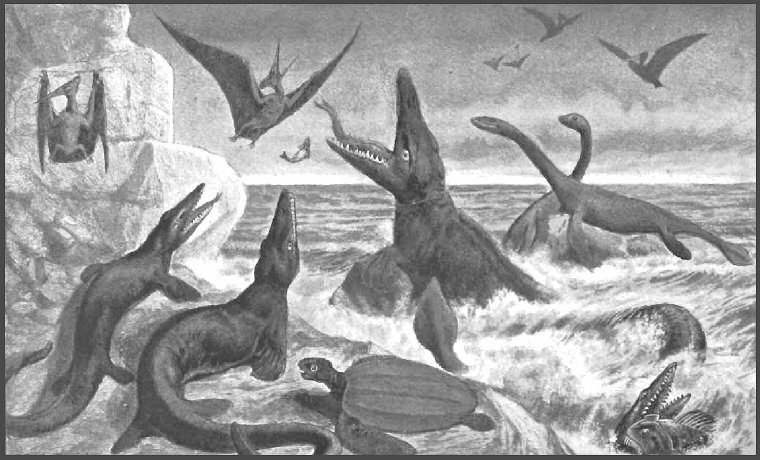 The occurrence of pliosaur material in the Fairport Chalk (lower Middle Turonian) is at or near the last known occurrence of this group prior to their extinction. A polycotylid (Trinacromerum bentonianum) appears to be especially well represented in the upper Greenhorn Limestone and lower one-half of the Fairport Chalk (Lower and Middle Turonian), but is first documented in central Kansas from upper Hartland Shale Member, Greenhorn Limestone (middle Upper Cenomanian). 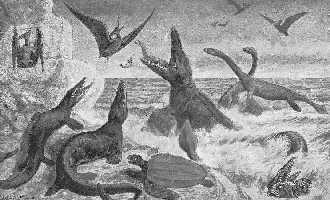 Elasmosaurid remains appear to be comparatively rare throughout this interval, with the only three firmly established records from the Graneros Shale and Greenhorn Limestone (Middle Cenomanian to Lower Turonian). 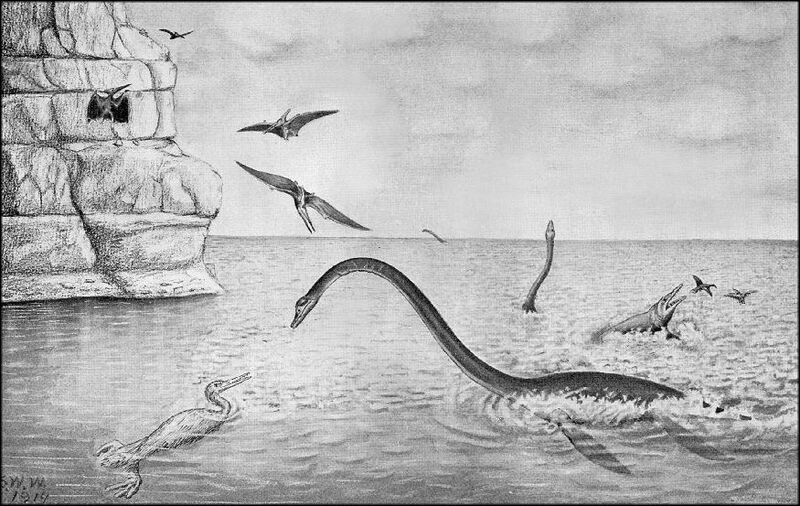 Since the discovery of the first plesiosaur in the Old Fort Benton Group by B. F. Mudge in 1873, a significantly greater number of plesiosaur specimens have been collected from this stratigraphic interval than from the overlying Niobrara Chalk. *Everhart, M. J., K. Shimada, and K. Ewell. Sternberg Museum of Natural History, Fort Hays State University. FIRST RECORD OF THE LAMNIFORM SHARK GENUS, JOHNLONGIA, FROM THE NIOBRARA CHALK. We describe the first occurrence of the extinct lamniform shark, Johnlongia sp. (Elasmobranchii: Odontaspididae), from the Smoky Hill Chalk Member of the Niobrara Chalk (Upper Cretaceous) in southwestern Trego County, Kansas. The specimen is a small isolated tooth which is morphologically unique and may represent a new taxon within the genus Johnlongia. It occurred near the base of the Smoky Hill Chalk where the stratigraphic level corresponds in age to the Late Coniacian. This record not only represents the first documented occurrence of the genus from the Niobrara Chalk, but also establishes the stratigraphically youngest Johnlongia specimen in the world. The addition of Johnlongia sp. increases the total number of lamniform species reported from the Smoky Hill Chalk to eight. The Johnlongia tooth is catalogued as VP-15545 in the collection of the Sternberg Museum of Natural History, Fort Hays State University, Hays, Kansas.